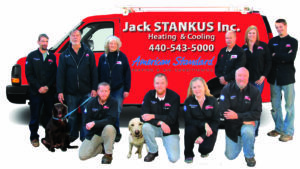 Stankus Heating – Quality Products and Services Since 1947! Quality Products and Services Since 1947! As a Customer Care Dealer and certified dealer for American Standard Heating & Air Conditioning and other nationally recognized brands of heating and cooling equipment, we offer the latest technology available. We specialize in new and replacement systems, hot water heaters as well as the maintenance and service of your existing heating and cooling systems. Stankus Heating & Cooling continually educates and trains its employees to the highest performance standards in the industry. We stand behind our work with our Stankus Guarantee. Stankus Heating and Cooling sells, installs and services gas, oil and electric furnaces; air conditioning systems, gas and oil boilers, thermostats, heat pump systems, electronic and high-efficiency filtration air cleaners, humidifiers; gas, oil and electric water heaters; and installs well pumps and tanks. Stankus Heating and Cooling believes in putting the customer first. Our goal and commitment is your comfort and peace of mind in your home or business. Thank you for taking the time to consider Stankus Heating and Cooling.